Can you pin video? Yes! In this post, we’ll explore how to use Pinterest to drive traffic to Youtube videos, Facebook videos, and other video platforms. Plus I’ll share how to upload a video pin without paying for a promoted pin, or ad, and how to make long pins for videos. This post has affiliate links for the services I recommend using. If you sign up using my link, I might get a commission. It doesn’t cost anything extra for you. Learn how to do this on your own blog here. Why use Pinterest to promote video? When you think of Pinterest, do you think of videos? 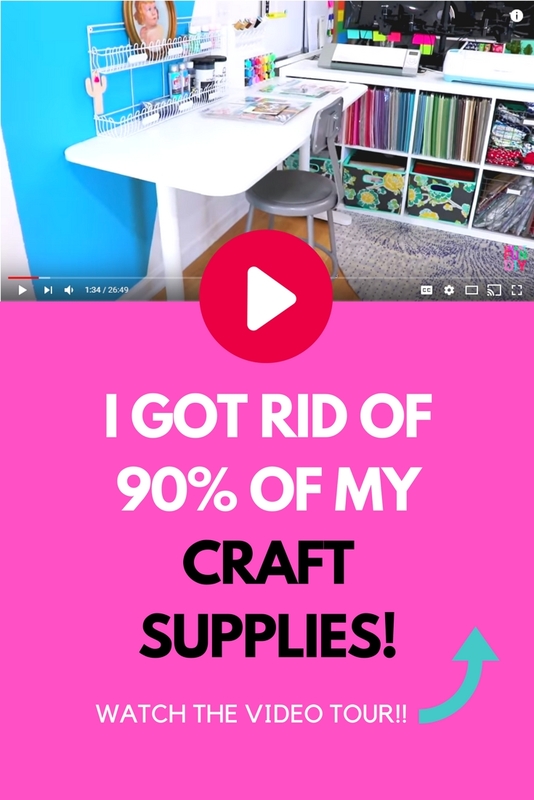 Videos started appearing on Pinterest as promoted pins and as pins from Youtube. But there are many more ways to use Pinterest to post and promote videos. 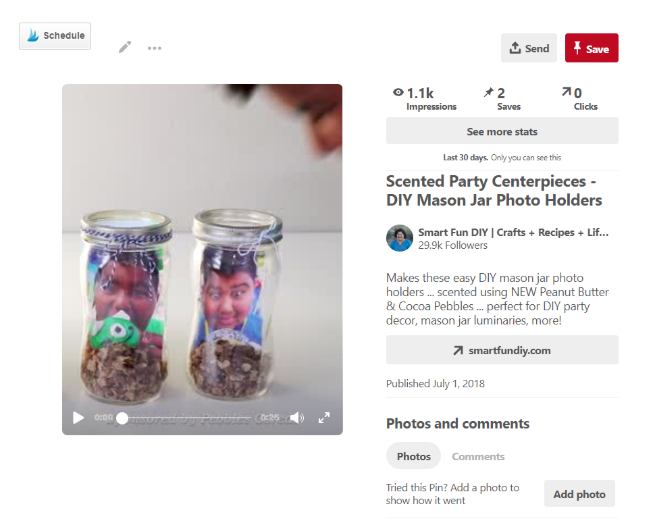 This summer at VidCon, Pinterest announced even more video features coming to the platform. With all of these features, the time is right to use Pinterest to promote and share your video content. You’ve probably heard the stat that by 2021, video content will make up 82% of all consumer internet traffic (source). So it’s no surprise that Pinterest is jumping into video. 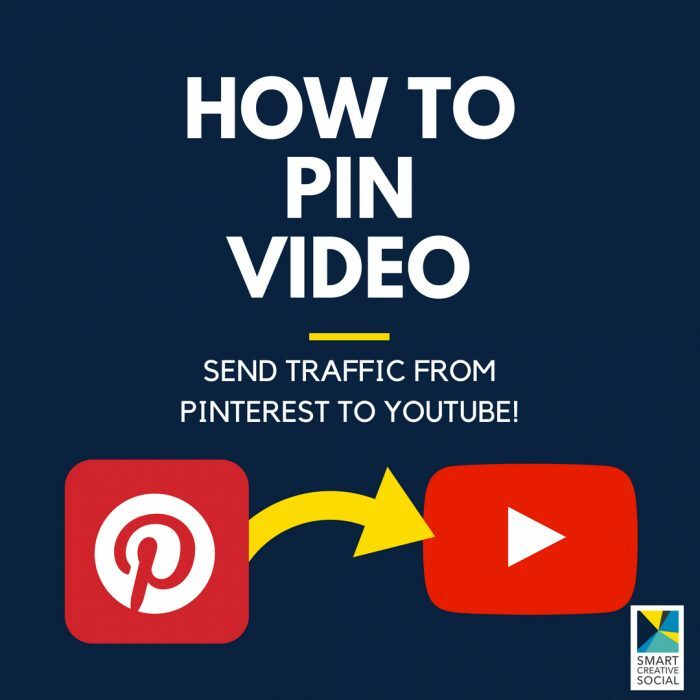 Beyond the video features Pinterest has recently announced (source), there are more surprising ways to use Pinterest to pin video to drive traffic to your videos on other platforms. According to a2017 Pinterest study, 75% of Pinterest users say they’re likely to watch videos about topics that interest them, compared to 55% of people on other platforms. With a quick scan of the Pinterest feed it’s clear that the majority of content on Pinterest is comprised of images and not video. Since pinners are open to watching video, it’s a great time to stand out in the feed with video content. In the same study cited above, Pinterest found that storytelling and how-to content perform best as promoted video pins. It’s not surprising that how-to and storytelling (vlog) content are also top topics on Youtube. If you’re making this type of content, your audience is waiting on both Youtube and Pinterest! Why not use these two platforms to reach that audience? More than half of Youtube views come from mobile devices. On Pinterest, the number of mobile users is as high as 80%. Pinterest users are already using mobile devices so it makes sense to serve them mobile-friendly video content from other mobile friendly platforms, like YouTube. YouTubers especially have found it more challenging to promote their videos off of the Youtube platform because YouTube is viewed as a competitor to social networks that also offer video capabilities, such as Facebook. Unlike other social media platforms that wish to keep users on the platform, Pinterest’s goal is to be a discovery platform. That means that links are encouraged! Content is placed in the news feed based on a pinner’s interests, not based on whether the content is linked. This makes Pinterest an excellent place to share your video content so it can be discovered. Earlier this year Pinterest introduced a Followers feed where users can see pins only from people they follow. Video is a great way to stand out among the sea of pins in the Follower feed! Google is the most used search engine in the world, followed by Youtube as the second largest search engine, which Google owns. But Pinterest is also a powerful for discovering content online, with 600 million visual searches every month. It makes sense to promote your content on Pinterest as another avenue of discovery. In December 2017, Pinterest issued a report on millennial behavior, which found that millennials are using Pinterest to make purchasing decisions. Millennials are even creating boards named “Should I buy this?” for example. The study found that millennials are largest consumer group in history, spending $65 billion per year. With video marketing on the rise, it’s not surprising that 4 in 5 millennials use video to make purchase decisions, according to Social Bakers. If you pin video to Pinterest, you’re increasing the probability that millennial users will discover your content while researching purchase decisions. According to Pinterest’s best practices guide, pinners are looking for more information about a pin when they click on it. The page’s content needs to match the pin’s description and the content on the page the pin links. Can you put long pin images on YouTube? Some video platforms, such as YouTube, allow sharing directly to Pinterest. However, sharing from YouTube to Pinterest results in a pinned video that plays on Pinterest but the video is in a 16:9 format. While you can pin a video from YouTube to Pinterest, it’s difficult to view on a mobile device because the video displays so small on the screen. The small footprint of pinned videos makes them easy to miss in the Pinterest feed, which is filled with long images. Pinterest has recommended that pins stick to a vertical aspect ratio of 2:3 or 600 pixels wide by 900 pixels tall. There’s no way to add this type of optimized pin image to a Youtube video, for example. Considering all of this, how do you create pins that drive traffic to videos and follow Pinterest’s recommended best practices? Use a graphics program to create a long pin image (2:3 aspect ratio) similar to the pin images you create to promote your other content on Pinterest. Upload this image directly to Pinterest since you can’t upload pin images to site like YouTube. Use Tailwind to load all of your pin images as drafts and then easily schedule them to multiple boards using board lists. Screenshot your video directly from the site hosting the video. Be sure to capture the video progress bar, play button or pause button, and any other operating controls overlaid on the video. These will help a pinner would recognize the content as a video. Make a long pin from the screenshot of a 16:9 video. Place the screenshot from the video at the top of the pin graphic and adding a play button graphic to the center of the long pin image. The play button graphic is a circle with a triangle in the center, pointed to the right. Most internet users recognize this as a play button and understand that clicking it allows a video to play. While the video won’t play when they click the pin button the first time, the link to the video will open when they click the pin a second time. Pinners will understand that the play button is a graphic that does not actually “play” a video. Including the play button will also help them to understand that this pins links to a video and not a blog post or product page. Next, add text to the pin graphic indicating that this pin leads to a video link. We want to make sure the pinner knows what kind of content will be delivered once they click. Always include a keyword rich description with your pin. Use the keyword “video” in conjunction with the other keywords. This can ensure pinners who are looking for videos on a specific topic can find your video. For example, a pin to a video for a chicken tacos recipe should include the keywords “chicken taco video” or “taco recipe video” in the pin description. On this pin image I added a screenshot of the video from YouTube to a pink graphic with a 2:3 aspect ratio. I added a play button graphic to the center of the screen. Below the pin title, I added a call to action indicating that this pin leads to a “video tour”. Use hashtags that reference video keywords such as “video” and “YouTube” to help pinners find your videos in search. To learn more about using hashtags, reference this free guide. Pinterest recently announced at VidCon that they have been slowly rolling out a new video upload feature. This feature will allow users to upload video directly to Pinterest aside from promoted pins. Previously, video uploads were only allowed on the platform if they were promoted pins. Now you can actually pin video directly on Pinterest! 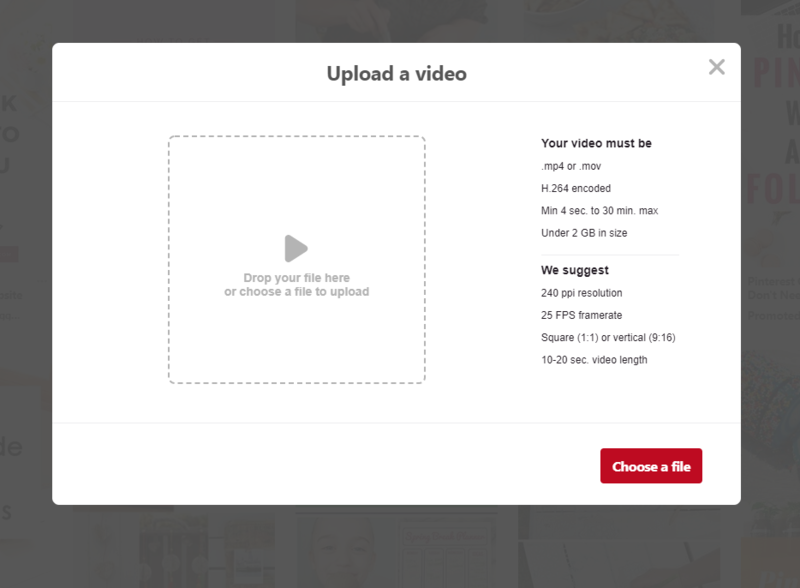 Who can use the new video upload feature on Pinterest? The new video upload feature is available to business accounts only. 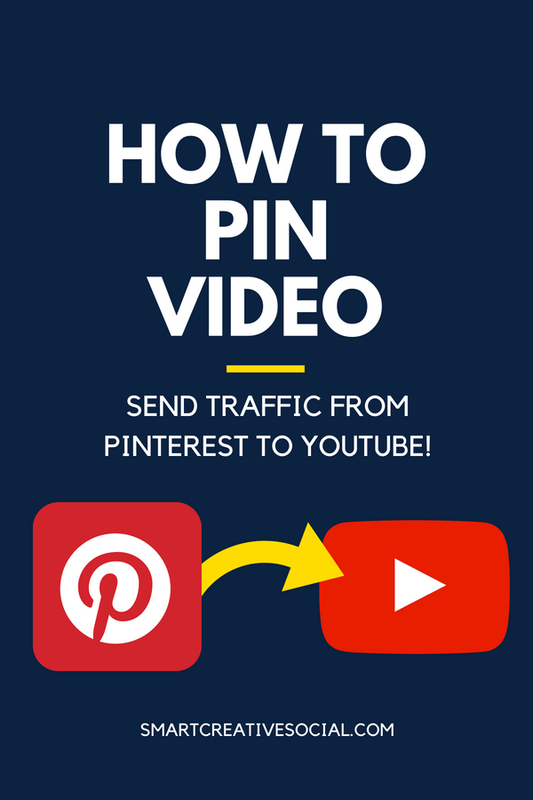 You can add the video to Pinterest the same way you add a pin image. Once uploaded, the video will take a few minutes to finalize and appear on your boards. What results can we expect from pin video? I’ve been experimenting with this feature in the weeks since VidCon. I have seen a spike in impressions on the video pins but fewer saves and clicks than I usually expect. The data from the video pins is aggregated with the data from the graphic pins from the same url. It’s a little challenging trying to determine which results came from which pins. Before you dive in to uploading your vlogs to Pinterest, consider the length, format, and dimensions of the video pin. To stand out in the feed, crop your video to a 2:3 aspect ratio. You may need to shoot your videos with a little more white space around the subject to allow for cropping. Edit the video to share a snippet of the action to compel pinners to click over to view the entire video. Pinners may have an expectation of seeing the full video when they click the video pin to play. Make sure it is clear that the video pin is a taste of what’s to come and they need to click to the link to see the full video. In the video description, be sure to include a strong call to action to get pinners to watch the full video on the linked platform. 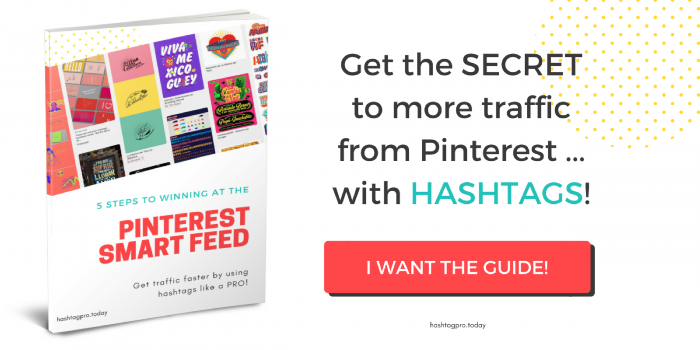 Want to kick your Pinterest account into high gear and start getting massive traffic? You need this FREE training … sign up NOW! Pinning from YouTube or other social media platforms means that we can’t rely on Google Analytics to verify that the traffic to a specific url came from any specific pin. So how do we verify that our videos are actually getting traffic from Pinterest? Is Pinterest sending traffic to your YouTube channel? 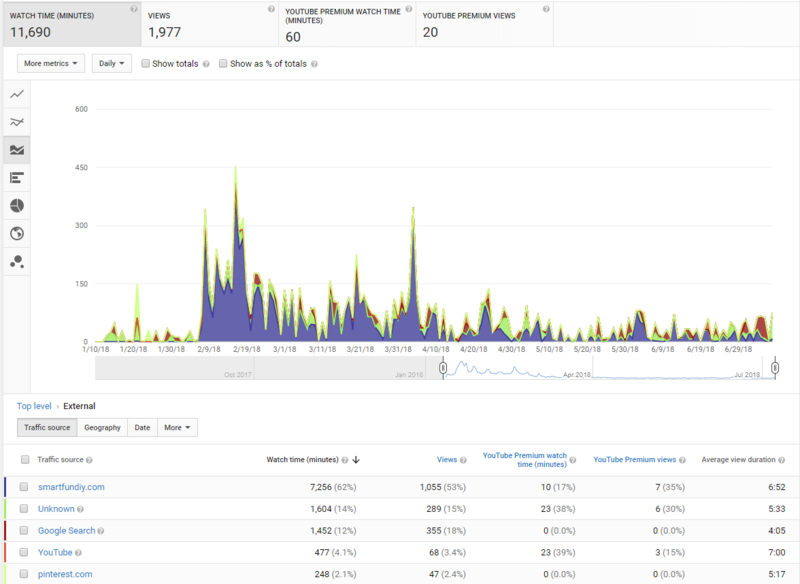 In YouTube Studio, click the Analytics link on the left. From the submenu, select “Traffic Sources”. From the panel that opens, select “External”. Scroll through the list of external traffic sources until you reach “Pinterest.com”. 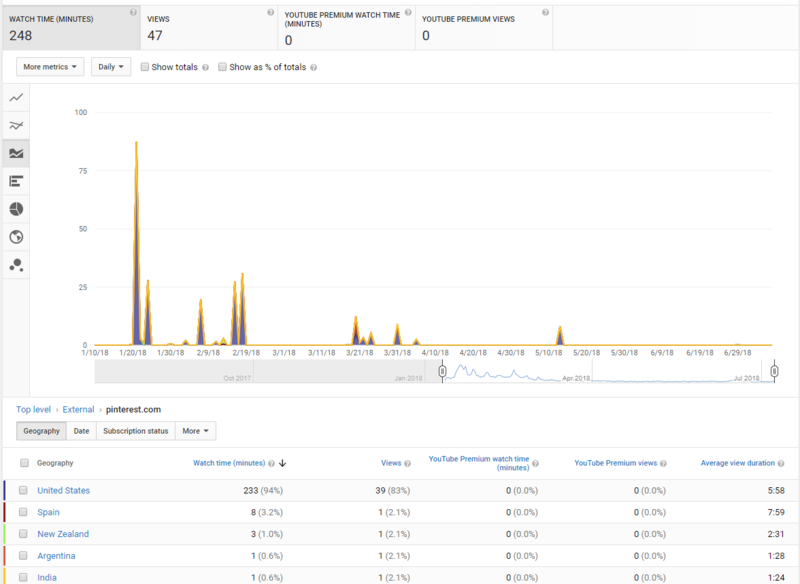 From here you can see the overall traffic sent from Pinterest to your YouTube channel during the selected time period. Click on the “Pinterest.com” link from the list. This displays the watch time minutes per country for users visiting your YouTube channel from Pinterest. You can select to see even more metrics from the “More Metrics” drop down menu in the upper left corner of the screen. Is Pinterest sending traffic to specific videos on my YouTube channel? Search for a video in the search bar or by scrolling through the list of top videos at the bottom of the screen. 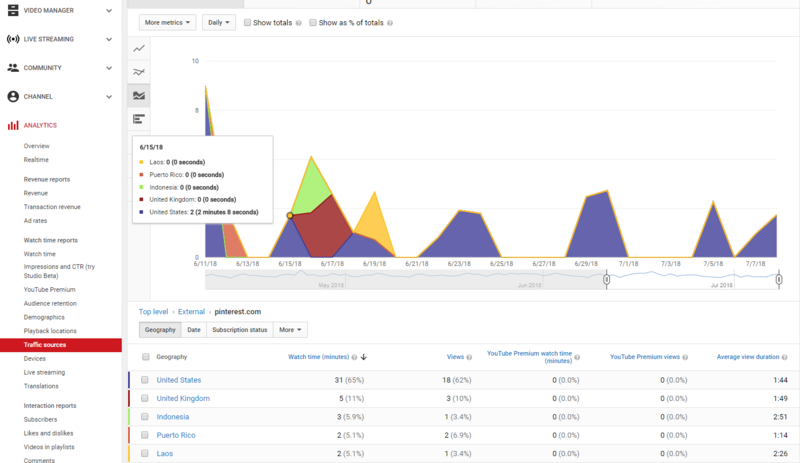 Click on the video link to open the analytics report for that specific video. From the Traffic Sources panel at the bottom left side of the screen, click on “Other”. The image above shows a report from a video that I pinned less than 10 times to Pinterest via Tailwind in the last 6 months since it was published. Though the 2% of overall traffic that Pinterest sent to the video is not very significant, every single visitor was not subscribed to my channel when they visited. Does pinning Youtube videos actually work? On the watch time report, you can see the spikes in traffic that correlate with every instance that I pinned the video to Pinterest. I aggressively pinned the video in January when it was published, resulting in a spike in traffic from Pinterest. I received less traffic as I pinned the image less frequently. Going forward, I’d refresh the pin description, choose a new hashtags, and create new pin images to keep the content “fresh”. That way, Pinterest continues to serve it up to pinners. Use Tailwind to pin the video at least once a week so that the traffic to YouTube becomes steadier and more consistent. With a consistent pinning strategy using Tailwind, you can drive measurable traffic from Pinterest to Youtube videos. Pinterest is in the business of helping pinners discover new ideas. that means your YouTube links will receive the same traction as blog or product links. You can’t get this kind of reach from any other social media promotion activity! You need to pin video! How will you use Pinterest to promote your video content?